Oakworks has been providing customers with innovative medical equipment, excellent service, and cost effective solutions for over 40 years. Oakworks Medical has collaborated with leaders in the medical specialties we serve to create cutting edge table designs and patient positioning devices that balance the needs of both patients and practitioners. We are committed to identifying the needs of our customers and providing solutions that are cost effective. 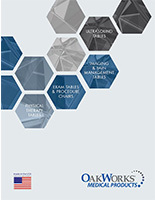 Oakworks, Inc. is ISO 13485 certified. The ISO standard is intended to ensure that medical device manufacturers have the required quality management systems in place to safely design, manufacture and distribute medical devices. This registration certifies that Oakworks' quality system conforms to these requirements in our state-of-the-art 90,000 square foot manufacturing facility in Pennsylvania. Since its inception, Oakworks has been committed to health and safety. Ergonomics for practitioners are paramount in our design process and in our facility. We strive to secure the health of our planet and have partnered with Trees for the Future as Global Cooling Partners, committed to having a zero carbon foot print through the planting of trees. To date, we have planted over ONE MILLION trees.